In early 2018, AICBR sought out to characterize current climate change adaptation as it relates to our food system. As part of this work, we created an inventory of all the food system related initiatives, entities and services which relate to our food in the Yukon. Additionally, through linking up with our partners at Food Secure Canada and the University of Saskatchewan, we were able to broaden the scope of the inventory and capture food systems assets from across the North (study regions: Yukon, Northwest Territories, Nunavut, Nunatsiavut, and Nunavik). This work is being done to develop a more comprehensive picture of our current food systems, characterize the activities and assets going on, strengthen potential partnerships between organizations and communities, and further information sharing and knowledge mobilization to inspire action. The data was gathered by a mixture of compiling existing AICBR and partner inventories, community outreach to Yukon communities (between October - November 2018) and an online survey. The Yukon dataset was merged with other inventory work that was done to capture initiatives/entities/services in NWT, Nunavut, Nunatsiavut, and Nunavik; this data was gathered mainly through internet scans and online surveys. Note: The northern map is only meant as informational and should not be used to compare assets or gaps across regions, as the data collection methods may have differed across regions. Creating an inventory of food systems initiatives, entities and services will allow us to identify promising practices and where more work might be needed to improve self-sufficiency and food security, particularly as it relates to adapting to climate change. 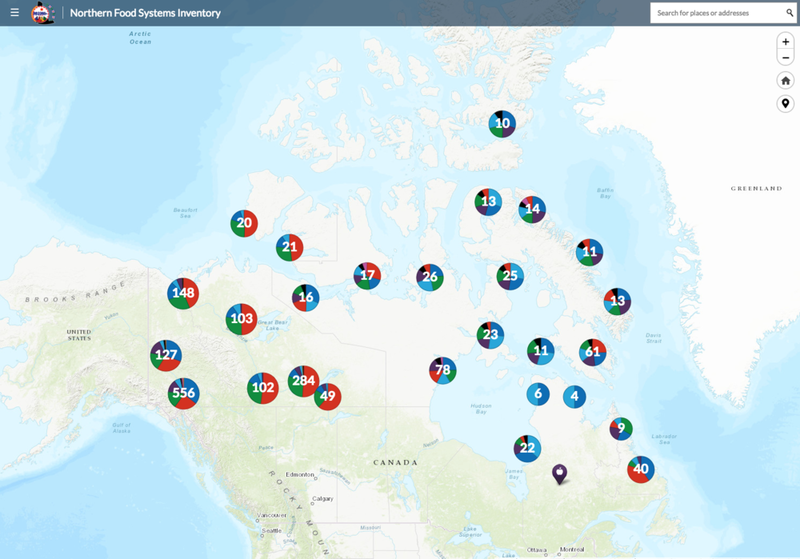 These food systems map are linked with the Yukon Climate Change Inventory Map, which compiles information on climate change adaptation, mitigation and monitoring assets. As part of Year 3 (2019) of the Linking a Changing Climate with a Changing Traditional Diet project, AICBR will be doing some face-to-face workshops across Yukon communities and developing some educational tools and knowledge products as part of the mapping promotion and outreach. In 2020, a second iteration of the food system and climate change maps will be completed to capture new or missing initiatives, not currently featured. If you have a project, you wish to see represented on the map - we invite you to fill out the online survey below. Read more about the Linking a Changing Climate with a Changing Traditional Diet project. We want to acknowledge our project funder Crown-Indigenous Relations and Northern Affairs Canada (Climate Change Preparedness in the North Program) and Esri Canada. Specific thanks goes to Michael Leahy and Susie Saliola, who are part of Esri Canada’s Education and Development team, for their work developing these mapping applications. We are based in the capital city of Canada’s Yukon Territory, Whitehorse. Please visit our Contact Us page if you would like to get in touch with us.